Ardath Tobacco Company was established in 1896 by Sir Albert Levy. The company did not issue cards until just before the First World War. The first sets were photogravure reproductions of famous paintings by Rembrandt (1914), Rubens (1915), Raphael (1915) and Valasquez (1915). 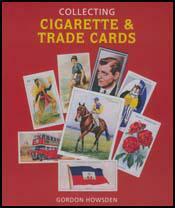 Ardath did not produce its first set of football cards until 1934. These were painted portraits of football stars. These looked so realistic that they appeared to be painted photographs. Its set Famous Footballers included portraits of Raich Carter, Jimmy McGrory, Ray Westwood, Hughie Gallacher, Jimmy Hampson, Robert Kelly, Eric Brook, Sammy Crooks, Stanley Matthews, Cliff Bastin, Eddie Hapgood, Sam Cowan, Billy Barraclough, James Allen, Jack Bruton, Alex James, Gordon Hodgson and Reg Hollingsworth. In 1936 Ardath began issuing photocards of football clubs. Series A featured 110 clubs in the North West. This was followed by the North East (110), Yorkshire (110), Scotland (165), Midlands (110) and London and Southern Counties (110). After this date Ardath ignored the subject of football and concentrated on producing cards on Film, Stage and Radio Stars.